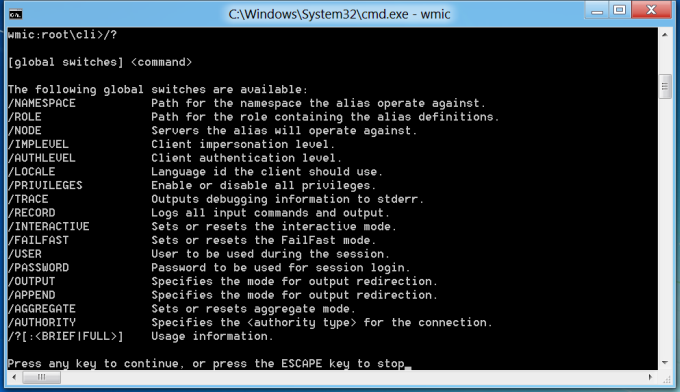 Windows Management Instrumentation Command-Line (WMIC) is the Windows most zealously kept secret. Why? Because Windows has had a proper command line since 2000, that is eleven years now, and yet, few people knew about WMIC, let alone used it. Belatedly, it is time to end the era of secrecy and unveil WMIC, Dedoimedo style. In this short tutorial, I would like to show you a sample of what WMIC can do. It's a most powerful tool and it complements the existing management and administration utilities and tools, like the regular command line and PowerShell. We'll do it on Windows 8 developer preview edition, but in practice, any version of Windows will do. 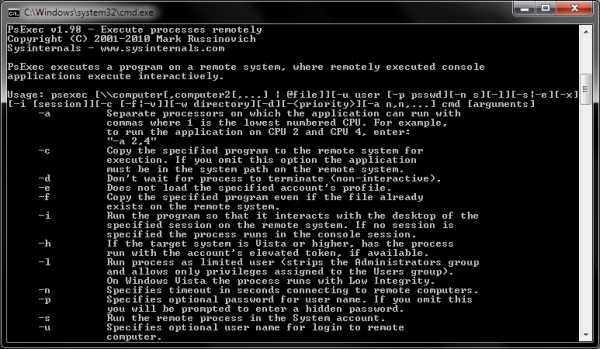 At work or home, you can fully locally and remotely manage your Microsoft systems from the command line. Bloody awesome. You can issue WMIC instructions directly, using a somewhat SQL-like syntax or you drop into the WMIC shell and then run commands there. The second mode of work is most useful when you want to test and tweak your work before creating automated scripts for unattended systems management. Let me remind you again, works equally well for local and remote tasks. Now, you can start using the shell. Type /? to get help, or rather a full listing of global switches and commands available. Then, you can further expand by typing one of the available switches or commands with the help flag to get its options. One of the most powerful features of WMIC is the ability to control process: get a complete list with names and process IDs, send instructions and calls. Really dandy. Now, let's terminate Notepad. Please note the PID is different now. What we do is the following command, a simple sort of sentence-like statement, where we determine the condition and the action, plus the return value so you can check the sanity and success of your administration work. In this example, we try something different. We specify the node we want to connect to, and it's localhost this time. Then, we also write the username and password, which lets you run commands as specific users. This could be of cardinal importance, if you must log the execution of commands or require certain privileges. 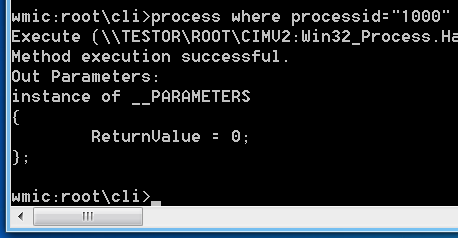 Finally, we name the process rather that go by the process ID, and we have it terminated. And more. Truly, you are only limited by your imagination and skill. Another similar tool is PsExec, a part of the famous and highly useful Sysinternals suite, which can be used to execute commands on remote computers, simplifying administration. Now, this is not specifically related to WMIC, but while we're at being super cool from the command line in Windows, why not have it all? 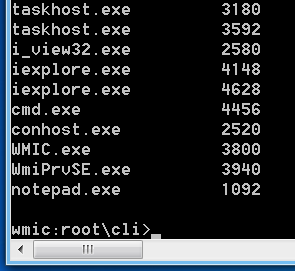 WMIC is such a powerful, so little known tool. And it's been around for eleven years! Eleven. Think of all the flexibility and control you have, all so well obscured by the GUI use of the Windows operating system. Well, no more. Just a decade late, this article teaches you all you need to know to become super cool. In all sincerity, mastering WMIC is a great way of pimping up your Windows skills and making the administration that much easier. It should also help you get rid of all kinds of third-party tools that pretend to do the hard work for you, where they only act as fancy frontends for the technology that's already there. As a Linux guy, this opens a whole new world of possibilities before me, making Windows so much appealing for serious work. Well, I hope you learned some new and valuable today. We shall have a sequel soon, too. See you around. Many thanks to Frankie Four Fingers for this tip!